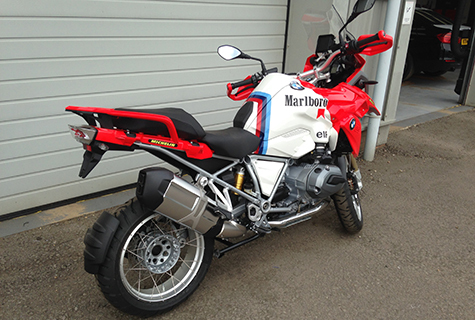 This BMW R1200 GS adventure was 1 of 2 painted for Wollaston BMW Motorrad dealership. 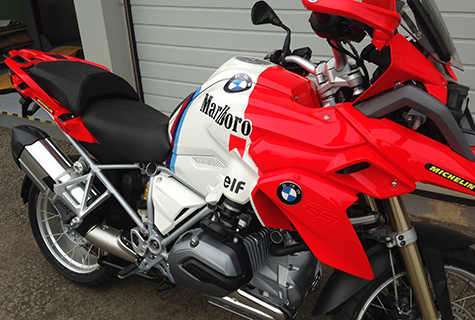 Based on the 1986 Paris-Dakar rally bike ridden by the tiny Belgium racer Gaston Rahier. At 5`4 Gaston was a tiny man that could only mount the giant BMW by running alongside the bike feathering the clutch and sidestepping onto it whilst moving. The bike we see here was subsequently sold by Wollaston BMW but brought back to us by its owner for minor paintwork caused when it was kicked by a donkey whilst on Safari in Marrakech.